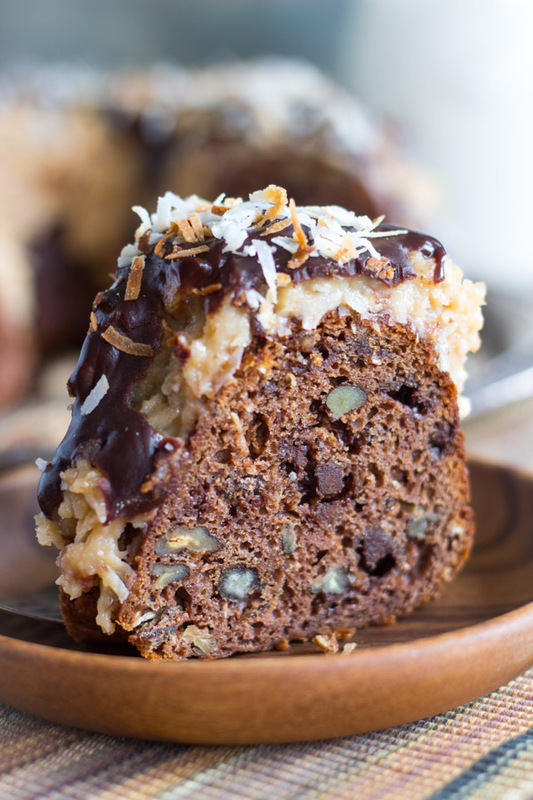 Not your ordinary cake recipe, this German Chocolate Bundt Cake is extra chocolatey, and loaded with coconut-pecan frosting! Better still, it’s ultra easy. 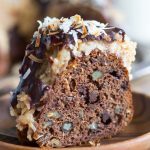 Made from doctored-up cake mix, this easy German Chocolate Bundt Cake recipe is one you’ll turn to often! 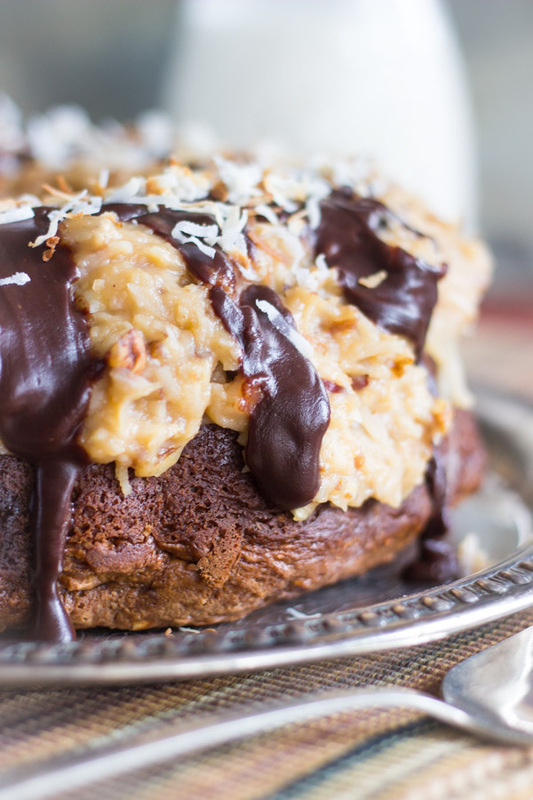 I seriously have no idea why I was inspired to make this German Chocolate Bundt Cake. I made this in early October, so I honestly can’t remember what prompted me to make it. I think I was just in the mood for something. I love these German Chocolate Brownies so much, and German Chocolate anything – come to think of it – so I must’ve just had a craving. I usually take notes as I’m making recipes, but I can’t find any notes about this one! I always take notes for this very reason… when I sit down to write, I can’t remember all the little things I wanted to tell you while I was making and photographing it. 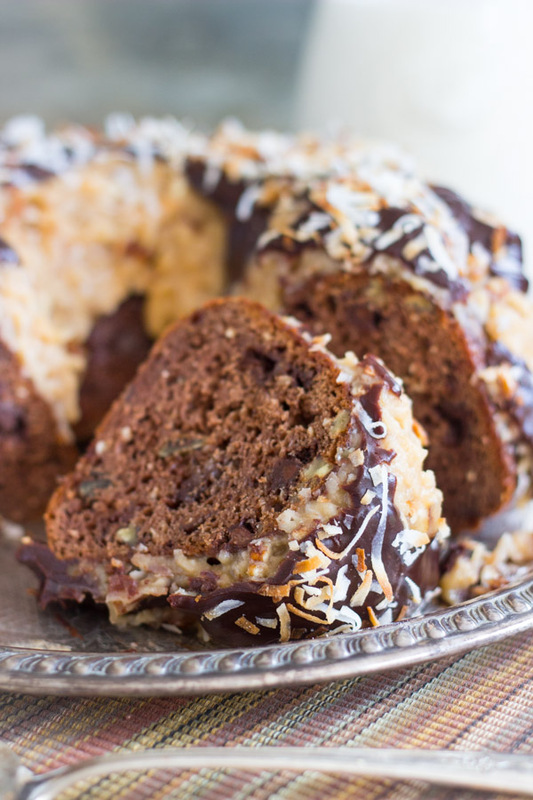 In the case of this German Chocolate Bundt Cake, it wasn’t just a few weeks. Five month went by. FIVE MONTHS. These things happen. I overbake and overplan for the blog, and it’s hard to keep up with the writing. Today is one of those days. I’m struggling! And it’s not helpful that my S.O. is blaring “Cheers” reruns in the background. It’s fun to watch that show again, but it’s a total distraction. 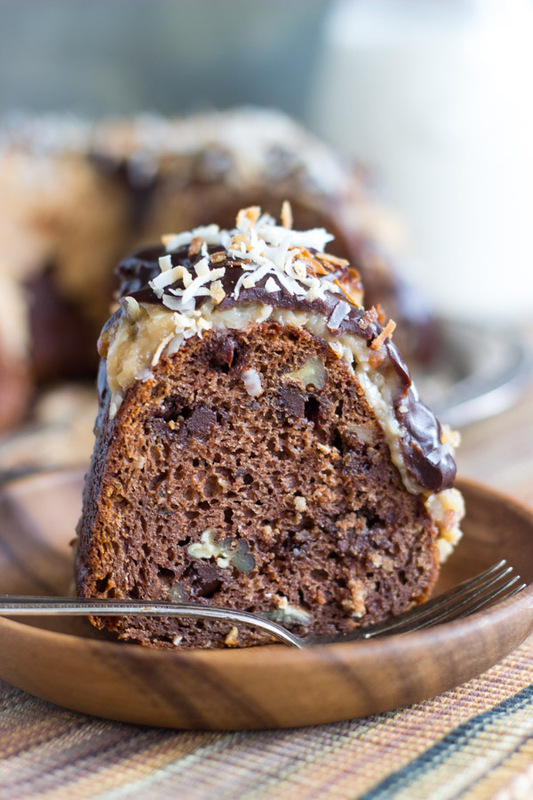 Okay, this Easy German Chocolate Bundt Cake recipe. My Grandma’s Pistachio Bread is really more like cake, and it’s super moist and wonderful. It starts with cake mix, and it gets doctored up pretty good. 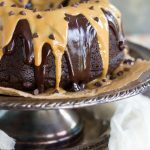 I used her recipe to make this German Chocolate Bundt Cake. However, there are a few notable changes that make a tremendous difference. The pistachio bread recipe uses pudding mix to doctor up the cake mix. I used coconut cream pudding mix. Yes!!! Extra coconutty flavor to this cake right at the outset. I also added milk chocolate chips to the cake batter (why not? ), pecans, and shredded coconut. You could almost stop there, but you shouldn’t. 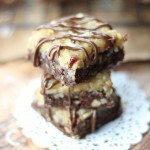 For the coconut-pecan frosting, I used the same recipe as these in the German Chocolate Brownies. That frosting is gooey, sticky, caramel-y, sweet, and just all-around awesome. The pecans give it a little soft crunch. And because it’s more fun if this German Chocolate Bundt Cake is over-the-top, but still ultra-easy, I made a quick batch of milk chocolate ganache in the microwave, and spooned it over the top. I can always count on chocolate ganache to crank things up a notch. 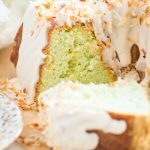 I have a bunch more simple and amazingly delicious cake mix bundt cake recipes. 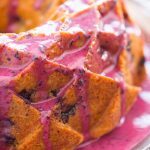 One of the most popular is the Lemon Blueberry Bundt Cake with Lemon Glaze. That thing is ultra-popular and gets wonderful reviews. It is so moist, and the lemon flavor is so vibrant! Incidentally, I have a Lemon Bundt Cake too, and just Blueberry Bundt Cake too…. Other fave cake mix bundt cakes that include chocolate would be this Dark Chocolate Peanut Butter Bundt Cake and this Oreo Bundt Cake. 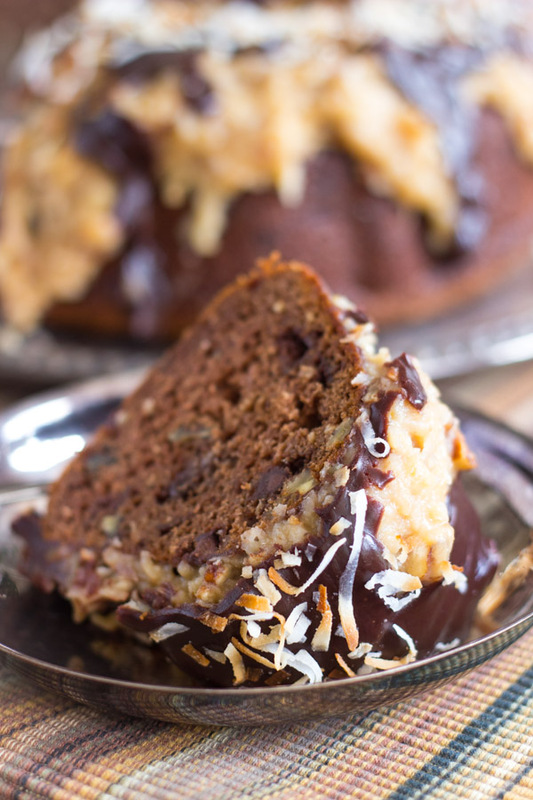 Not your ordinary German chocolate cake, this one is extra chocolatey and loaded with coconut pecan frosting! In a large bowl, stir together cake mix, instant pudding mix, eggs, sour cream, oil, chocolate chips, pecans, and coconut. Batter will be thick! Remove pan to a wire rack to cool for 10 minutes, then invert the cake onto the wire rack to cool completely. In a large saucepan over medium heat, combine sugar, evaporated milk, butter, and eggs. Stirring constantly, bring the mixture to a boil. Do not walk away from it - it will heat and cook quickly, and you don't want to scramble the eggs! Once it comes to a boil and thickens, remove from heat, and stir in the coconut, pecans, and vanilla. Spread on top of the cooled bundt cake. In a small microwave-safe bowl, combine chocolate chips, heavy cream, and butter. Microwave on high at 30-second intervals until chocolate is melted and the mixture is smooth. 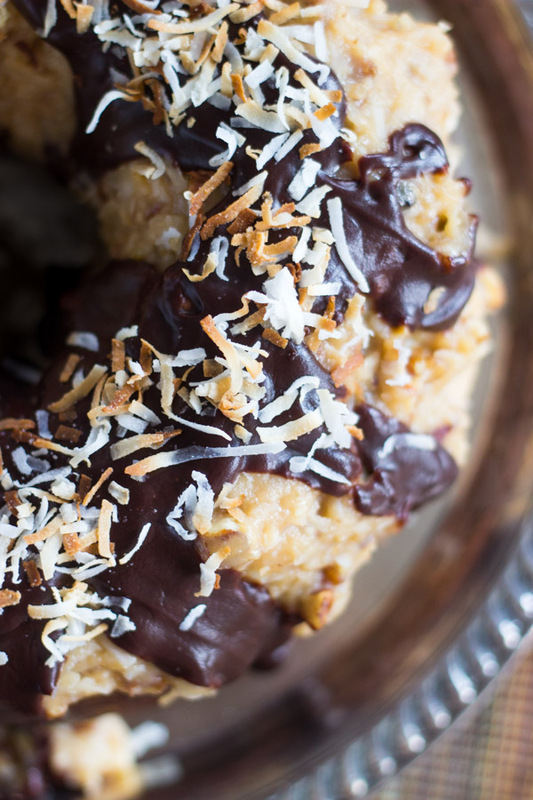 Sprinkle the toasted coconut over the ganache. Allow 10-15 minutes for topping to set. Cut and serve. To easily view all the recipes on the blog, follow along on Pinterest! I am not able to find “Instant” coconut pudding mix here…can I substitute regular cook coconut pudding(dry mix) instead? Delicious chocolate bundt cake for the weekend party and birthday. I m fond of baking and every week I try new cakes. This week I will be trying this one. Hope everyone will love it and thanks for sharing it. The cake mix I bought has pudding mix in it. Do I need to add pudding mix. Was I supposed to make the pudding according to the package first and then add it to the cake mix? Any suggestions on The frosting? Mine is coming out too runny. Hi Selene! I’m sorry to hear that. It should thicken as it cooks, and thicken as it cools. The eggs help bring it together – I would just make sure that you’re cooking it long enough that the eggs have a chance to thicken it! Good luck! What size of pudding mix? 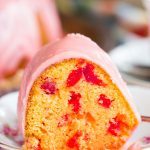 Can this receipe be used to make cupcakes versus cake? If so, how long do I have to bake them? In addition, are there any other changes that I need to make to the receipe? How do I pin your recipes? I want to save a bunch but don’t see a pin button? How can I tell if the frosting has finished cooking? I don’t want to serve raw eggs ? This cake is delicious. Wife said it would win a baking contest. LOL! That’s fantastic! I’m so happy you guys liked it. Thanks so much for the feedback! Love this recipe!! I made them in mini bundt pan and just cooked the same minutes as a cupcake and they came out perfect. I skipped the chocolate ganache and still amazing . If I make them the day before should I refrigerate? I was also thinking of putting the coconut topping in the fridge and then warm up and decorate in the morning. What are your thoughts?